Summer grilling at its best – grilled greek salmon kebabs! 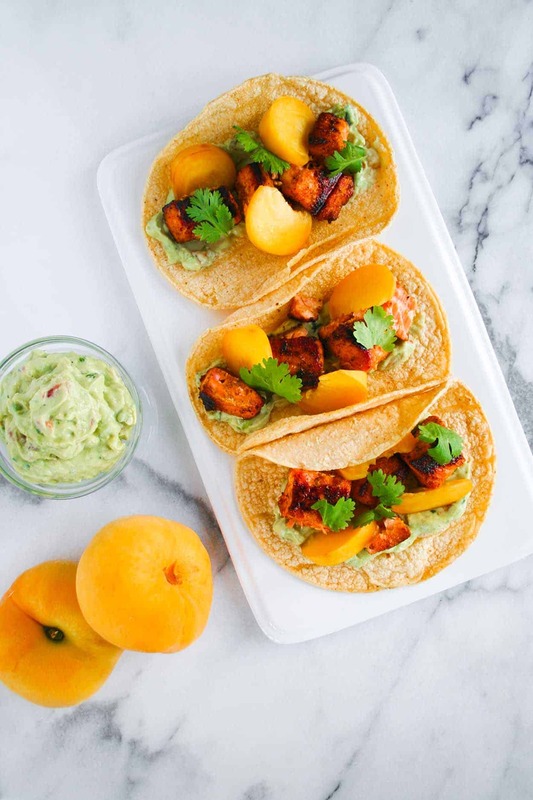 Only 10 minutes of prep and 10 minutes of cooking stand between you and the easiest weeknight dinner. These kebabs are gluten free, paleo, whole30 approved and AIP too! Let me guess: summer is so hot that you don’t want to turn on your oven? Let me also guess: you’re hungry, need food STAT, and don’t want to spend the night cooking? GUYS. 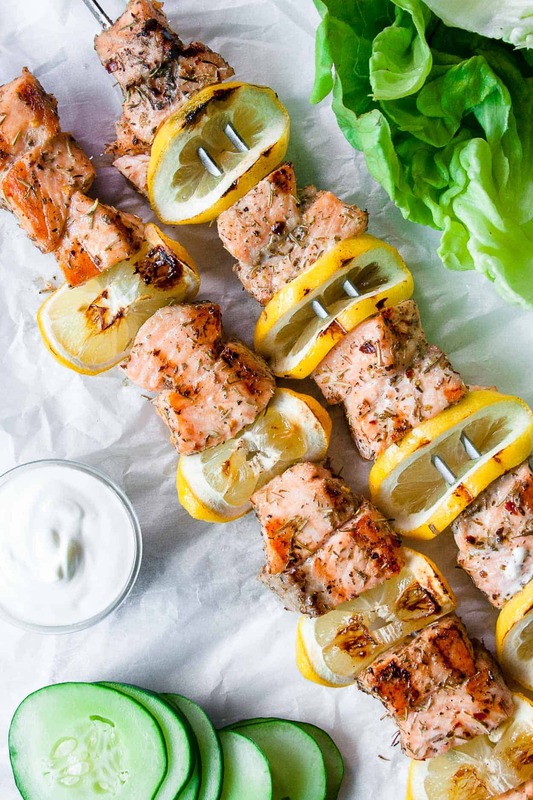 Then these grilled greek salmon kebabs are for you! Salmon is a staple in my house. It’s on our dinner table weekly, if not more. I am always looking for new ways to prepare it so we don’t get bored of the same ole thang. The flavors on the salmon are fabulous as is; but I love eating these as lettuce wraps with sliced cucumber and coconut yogurt. They are also fabulous with a little avocado too! But really, is there anything not fabulous with a little avocado? I don’t think so. 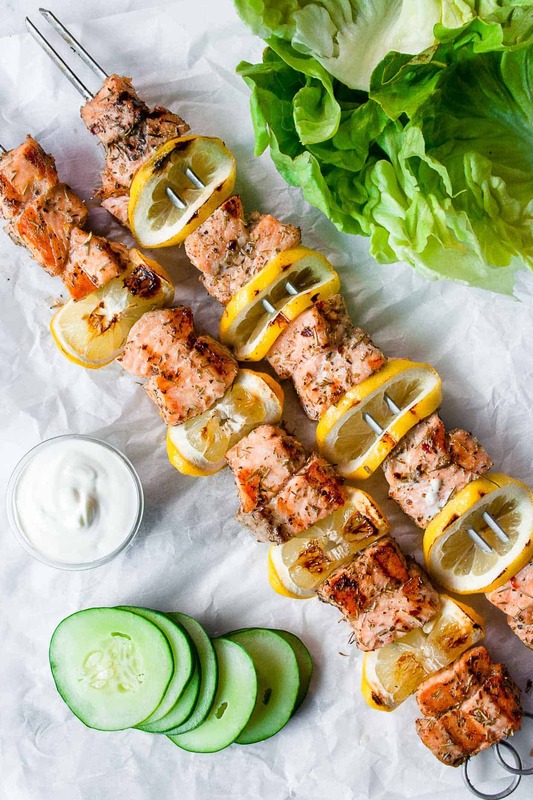 And you should also know, these salmon kebabs are gluten free (obvs), paleo (double obvs), Whole30 approved (!!) and AIP too! GRILLED GREEK SALMON KEBABS FOR EVERYONE! 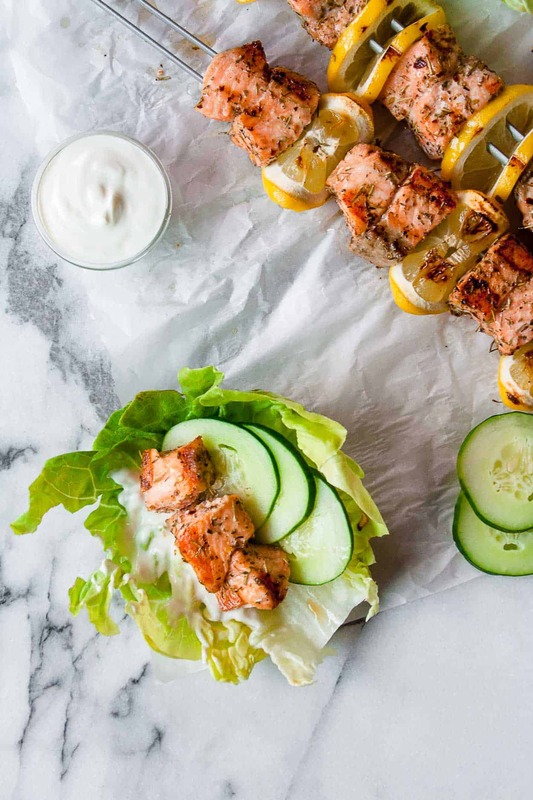 Make these Grilled Greek Salmon Kebabs and post a picture on social media and use the hashtag #imhungrybynature for a chance to be featured! Heat your grill to medium heat – about 300 degrees. 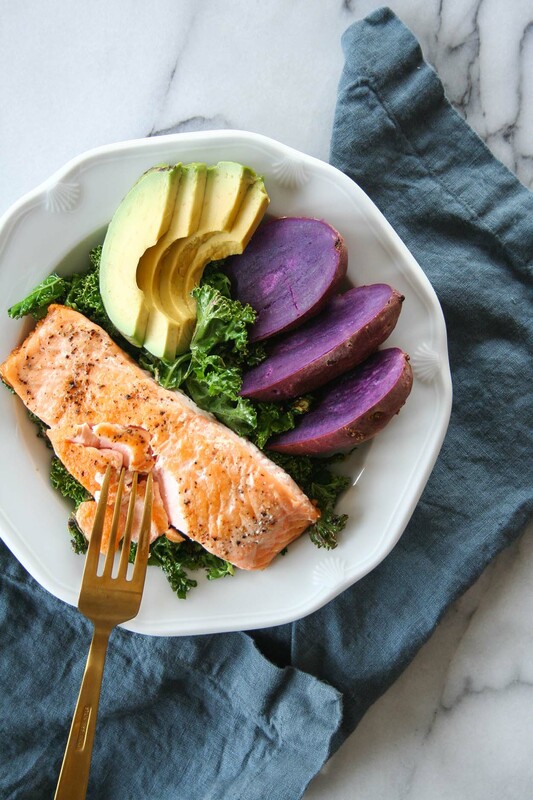 In a large bowl, toss salmon with avocado oil. Add the spices and stir until salmon is evenly coated. 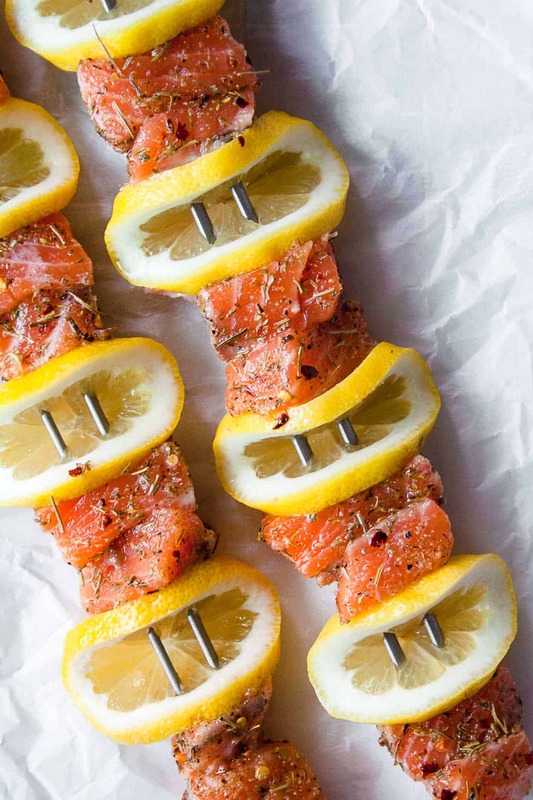 Skewer the salmon and lemon slices. 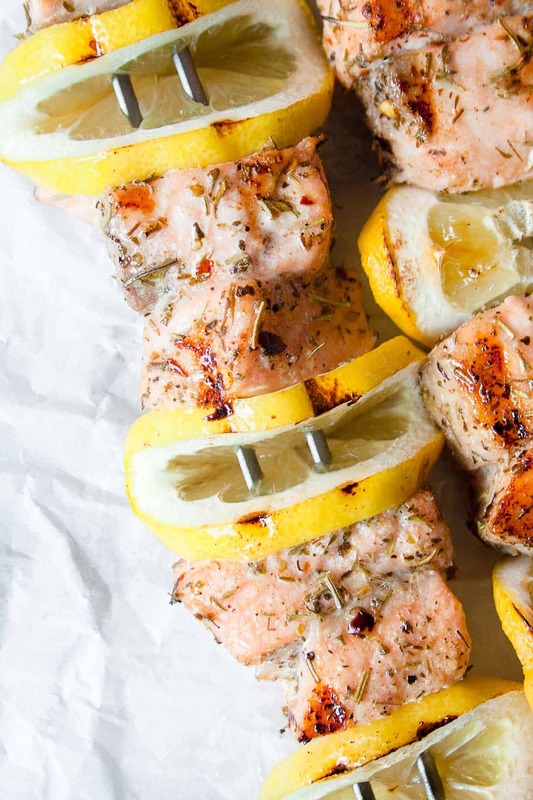 I prefer to use two skewers for each one – this helps keep the salmon and lemon in place. Grill skewers for approximately 8 minutes, flipping halfway through. Note: the salmon will release itself from the grill when it is ready. Looking for other delicious salmon recipes?